May the Christ in me see and honor the Christ in you, and the Christ in you see and honor the Christ in me. What if that was our expectation every time we met someone? What if that was the attitude underlying our national conversation and our recent presidential debates? What if that was the foundation for our marriages, parenting, and friendships? What if that was the common ground on which police officers and black lives stood? What if that was the starting point for resolving our theological differences? What if that was our intention when we had those hard conversations and dealt with those difficult people in our lives? What if that was how we approached all those seemingly dichotomous relationships: rich and poor, liberal and conservative, gay and straight, refugee or immigrant and citizen? What if we recognized that God resides in all people regardless of who they are, and we honored them for that and treated them with same reverence we give God? How would that change you? What would it ask of you? What might it do for your relationships? What difference would that make in the world? Maybe it would begin to heal us of our Pharisaism. When I say Pharisaism I am not talking about the Jewish people or Judaism. I’m talking about the human tendency to codify, solidify, and narrow our thinking and being into just one right way, my way. Pharisaism is not about a particular people or a particular religious tradition. It’s the human condition that infects all people and all religious traditions. It is as real today as it was in Jesus’ day. It deceives us into trusting in ourselves, seeing ourselves as righteous and regarding others with contempt. When I play the Pharisee, the one right way is always my way, or my country’s way, my party’s way, my religion’s way, my church’s way, my culture’s way. It’s my way or the highway. But what about God’s way? What about the way Christ showed us? I cannot claim to be a true follower of Jesus while continuing to do it my way. Pharisaism is the mother of profiling. Profiling happens when I look at the outside of another human being and make conclusions and judgments about his or her insides. Looking through the lens of my way I take his or her appearance, accent, actions and behaviors, lifestyle and life choices, faith, beliefs and practices, and make conclusions and judgments about his or her value and worth, dignity, motives and desires, intelligence and abilities, holiness and goodness. Those conclusions and judgments are always in my favor and against the other. Isn’t that what the Pharisee is doing to the tax collector in today’s gospel (Luke 19:9-14)? “God, I thank you that I am not like other people: thieves, rogues, adulterers, or even like this tax collector. I fast twice a week; I give a tenth of all my income.” Thank you that I am not like them and that I do it the right way. The truth is we all have some “thems” in our lives. The Pharisee sees only the outside of the tax collector. He has no idea about that man’s fears and hopes, his dreams and aspirations, his pain and struggles. He has no idea that he and the tax collector just might be more alike than he knows or wants to believe. Even as I make those statements about the Pharisee in today’s gospel I recognize that I am doing to the Pharisee what he is doing to the tax collector. I recognize myself in the Pharisee and the Pharisee in me. What about you? Have you ever been the Pharisee? Ever profiled another? Pharisaic profiling separates us from the other. We stand by ourselves. We raise ourselves up and put the other down. We make ourselves more and the other less. At some level, even if we are in denial, we know that is what we are doing. We understand what is happening. Here’s why I say that. Would you want to be seen and treated in the same way that, in general, black citizens, Syrian refugees, welfare mothers, or law abiding Muslims are treated in this country? Would you be happy for your children, spouse, or parents to receive that kind of treatment? Would you want to be seen and treated the way you see and treat your worst enemy? Raise your hands if that’s how you want to be treated or how you want your family to be treated. Anyone? No? No one? You don’t want that for yourself or your family? I don’t either. So why then is it ok for others to be treated that way but it’s not for me? There’s only one answer to that question. It’s not. It’s not ok but Pharisaism deceives us into believing that it is. That’s the lie Pharisaism tells. That’s the lie too many of us have bought into and live with. And it has, far too often, convinced us that it is better to be right than to do what is right. And if we’re being honest, most of us know the right thing to do. The lie that Pharisaism tells lives in the darkness of our fears. We fear the stranger, the other. We fear being powerless. We fear our life and world are spinning out of control. We fear that which is different and unknown. We fear losing our place in society. We fear their isn’t enough to go around and that whatever another gains is my loss. We fear not being enough. We fear intimacy and being vulnerable. We fear being hurt. We fear seeing ourselves in the other. We fear facing ourselves and the truth of our lives. We fear and then we profile. We stand by ourselves looking at the other through the lens of our way, trusting in ourselves that we are righteous and regarding others with contempt. But what if there is another way? What if we could stand outside ourselves and in the life of another? What if we could see and experience the other’s life and world as he or she sees and experiences it? What if we threw out the profile and simply wondered? No conclusion or judgments, just wondering? I wonder what untold story lives behind the face, words, actions, and circumstances of his or her life? I wonder what it is like to stand in their shoes, to see with their eyes, to face their fears, to struggle with their needs and desires, to live with their memories, to feel with their heart? I wonder what I would see, feel, do, and say if that was me and my life? Or better yet, instead of wondering we could ask him or her to tell us their story. What are your dreams? What do you fear? What are your joys and sorrows? Where does it hurt? Where do you find meaning? What do you need? What do your want for your life and your family? I suspect we would recognize many of their answers as our own. If I opened myself to the life of another in those ways, if I truly identified with the other at a deep interior level, if I loved the other as myself, if I allowed the Christ in me to see and honor the Christ in her or him would I still stand off by myself thanking God that I am not like them? No. I don’t think I could do that and I don’t think you could either. Instead, our hearts would break for love of them, our eyes would weep with compassion for them, our heads would nod with understanding and in solidarity with them, and our hands would reach out for our brother or sister. That’s exactly what God is doing in Jesus. In Jesus God chose to stand outside God’s self and in human life, to see with our eyes, to feel with our hands, to love with our hearts. Are we unwilling to do that for each other? In Christ God not only lives and experiences human life but invites humanity to live and experience divine life. He asks us to stand outside ourselves and in the life of another. 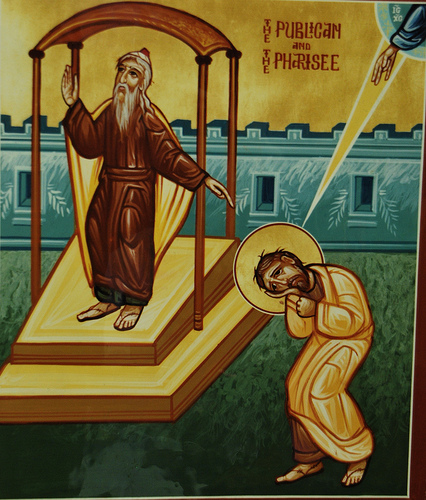 The Pharisee in today’s gospel (Luke 18:9-14) isn’t a bad guy. He’s not wrong or worse than the tax collector. He’s afraid. He’s afraid to face the truth of his own life. So he justifies himself. The tax collector, however, faces the truth about himself and he alone goes home justified. In facing the truth of our lives we open ourselves to see and honor the truth of another’s life. Loved this message. Something to help us get thinking, again. Thank you for posting. Thank you Nancy. God’s peace be with you. In a church I served, a Baptist deacon stood about six-foot-six, weighed probably 275 pounds, and wore size 14 shoes. Rod liked to say, “If the preacher don’t step on my toes, he ain’t doin’ much preachin’.” Well, Mike, I ain’t six-foot-six, don’t weigh no 275 pounds, and ain’t got size 14 shoes. But you done gone and stepped all over my size 11’s. It’s so easy for me to play the Pharisee. “I thank Thee that I am not like other people,” my crabby next-door neighbor, the young people down the street, living in sin, without benefit of clergy, or even like this presidential candidate. Lawrence, I love your stories and encouragement. Thank you. I hope you all are well. Thanks so much for your poignant sermon, dear Fr. Michael! I always find myself called to repentance and prayer by you. Blessings and Peace to you, Dear friend. Jan, I am grateful to be a fellow traveler with you.